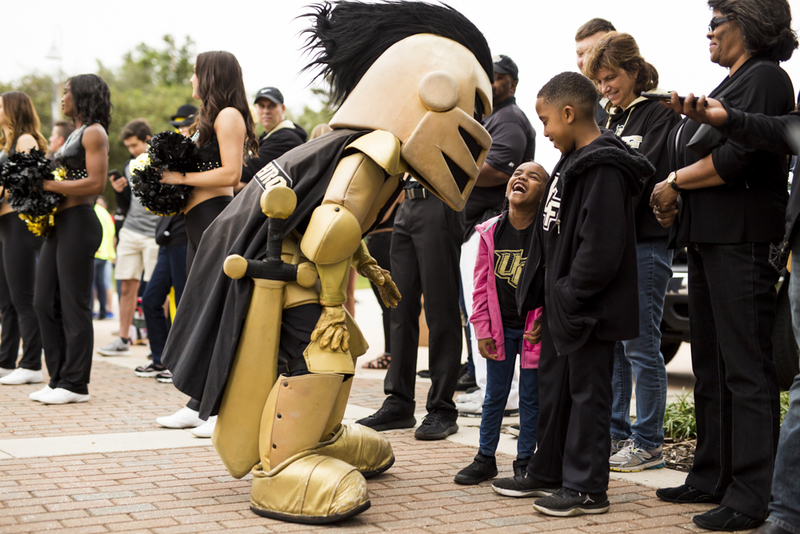 1Knightro stops to greet a young fan during Knight Walk. 2UCF cheerleaders perform the March to Victory as they head over to Spectrum Stadium for the start of the game. 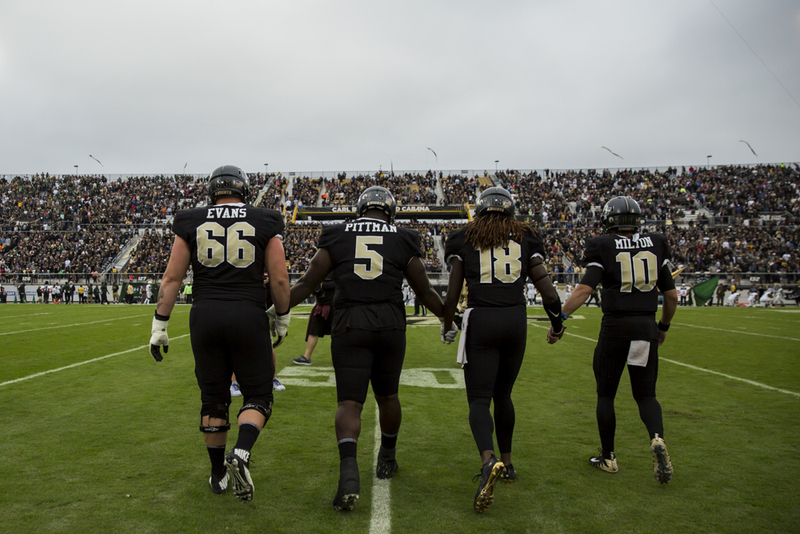 3The four captains for the Knights — redshirt senior offensive lineman Aaron Evans, senior defensive lineman Jamiyus Pittman, redshirt senior defensive linebacker Shaqueem Griffin, and sophomore quarterback McKenzie Milton — walk onto the field together for the coin toss. 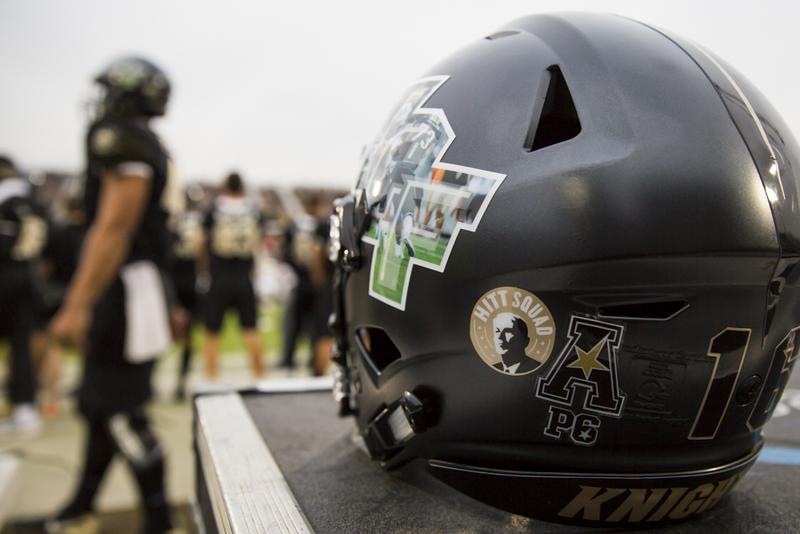 4Every helmet features a Hitt Squad sticker, in honor of UCF President John C. Hitt, who recently announced he would be stepping down in 2018. 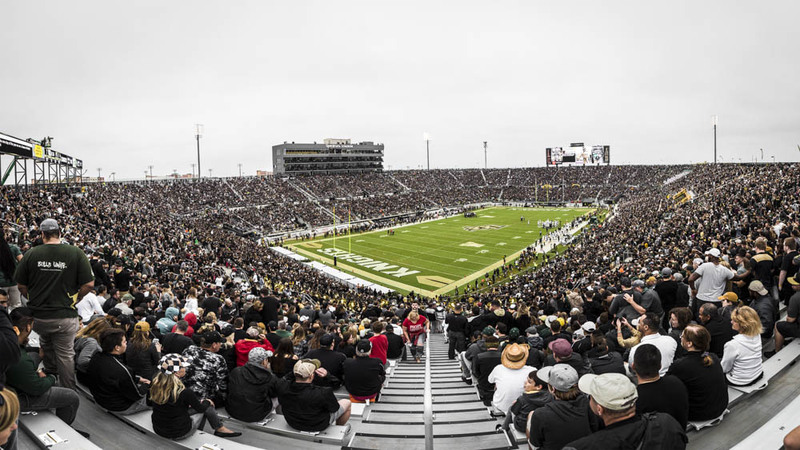 5More than 47,000 people fill a sold-out Spectrum Stadium as the UCF Knights took on the USF Bulls, in the War on I-4 battle. 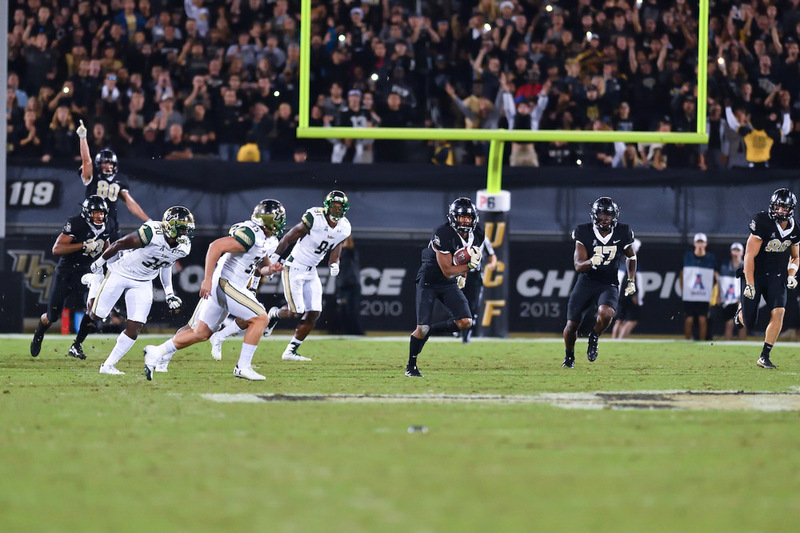 6Sophomore quarterback McKenzie Milton evades USF linebacker Nico Sawtelle to score UCF’s first touchdown of the night, making it 7—7. 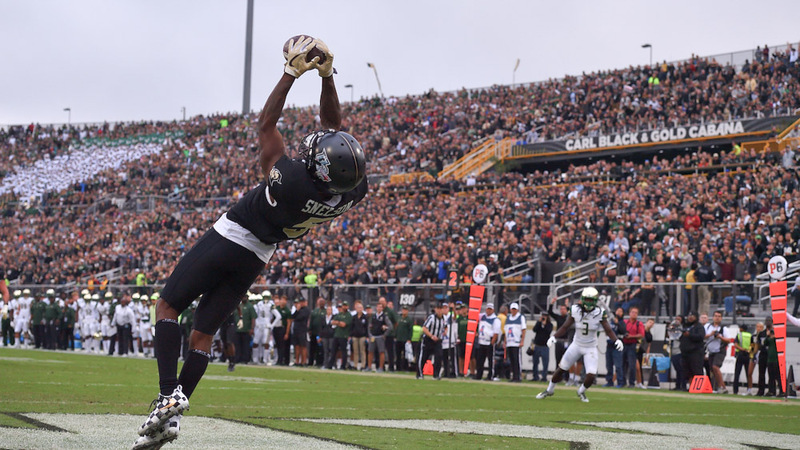 7Sophomore wide receiver Drederick Snelson catches a 16-yard pass from Milton, bringing the score to 14—7. 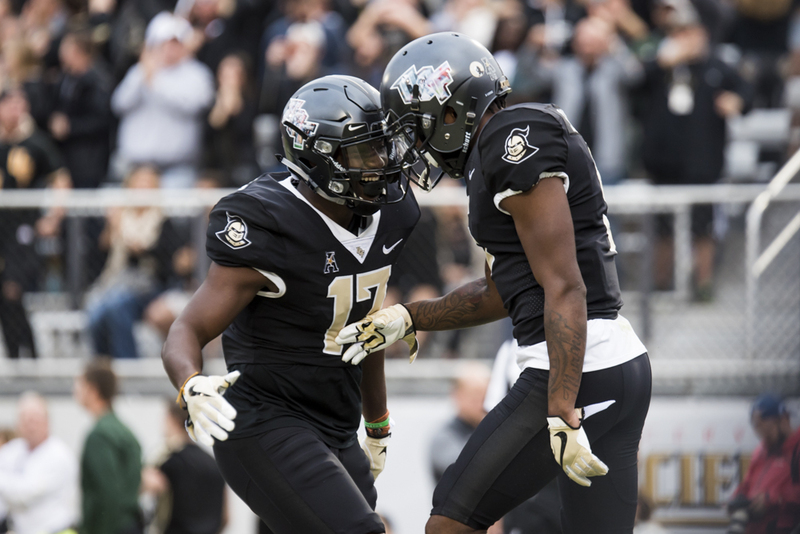 8Freshman wide receiver Marlon Williams congratulates Snelson. 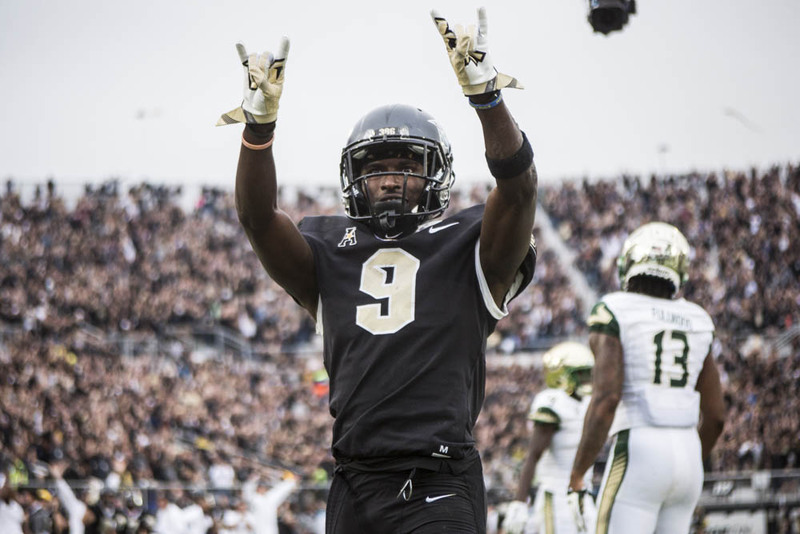 9After running in the ball for UCF’s third touchdown of the night, sophomore running back Adrian Killins Jr. taunts USF fans by throwing their traditional bull hand signal. 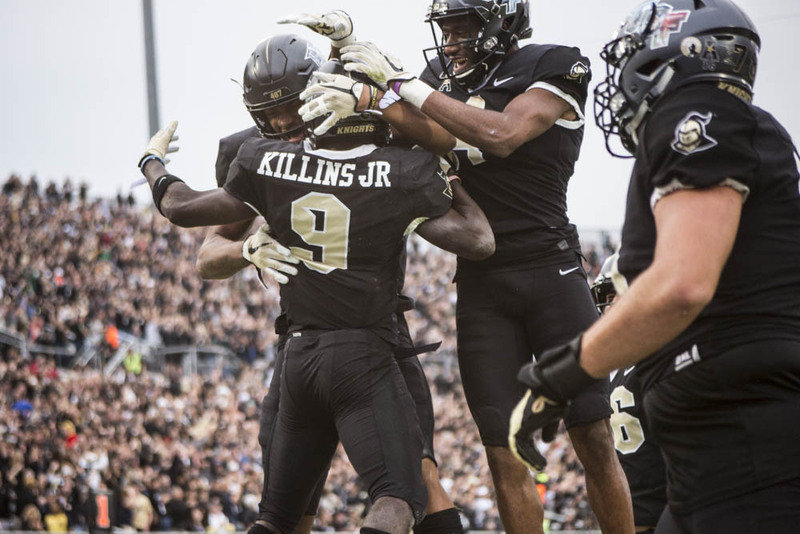 10Players congratulate Killins, who has rushed for 711 yards this season and scored 10 touchdowns. 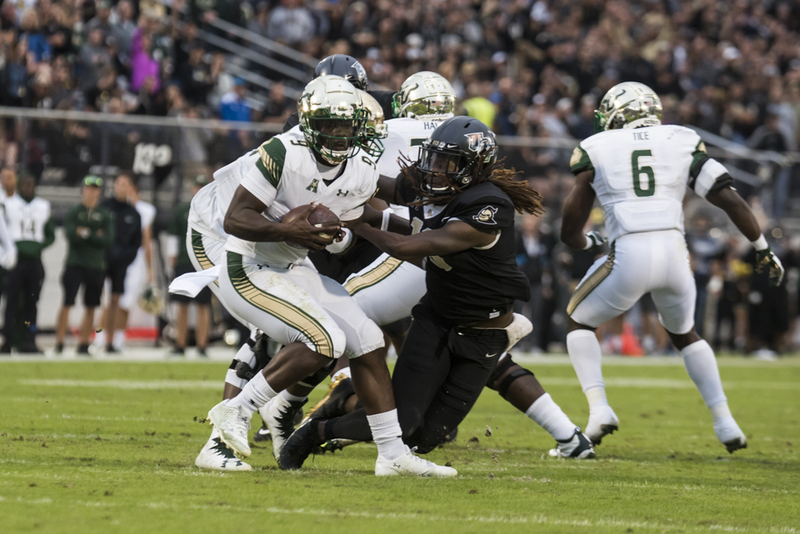 11Redshirt senior linebacker Shaquem Griffin attempts to tackle USF quarterback Quinton Flowers. 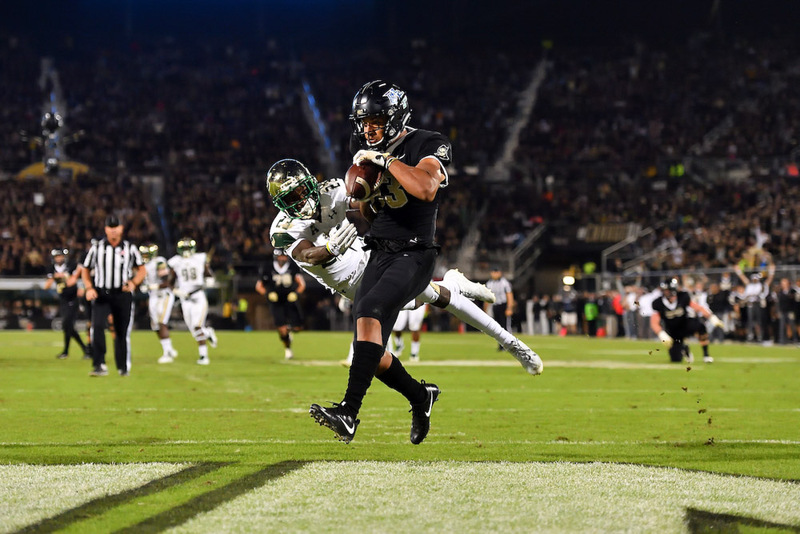 12Freshman wide receiver Gabriel Davis catches a pass from Milton to score the fourth touchdown of the evening, putting the Knights in the lead, 27–20. 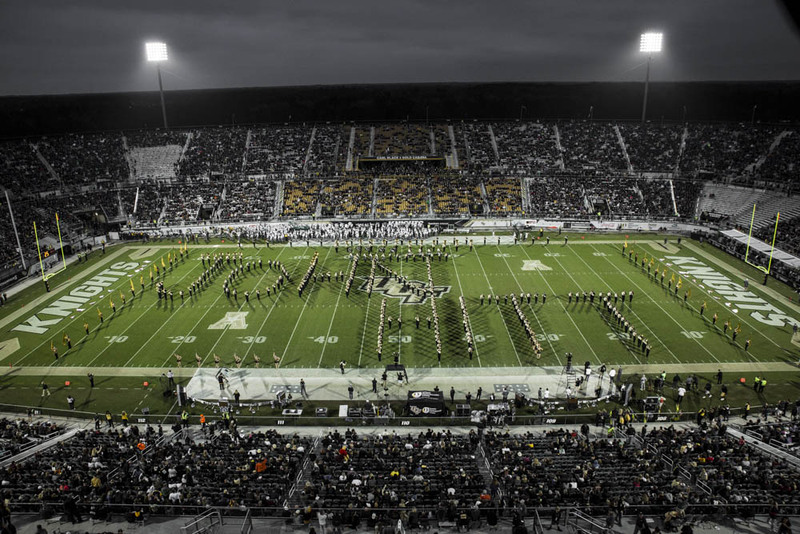 13During half time, the Marching Knights spell out John Hitt to honor his 26 years UCF’s president. 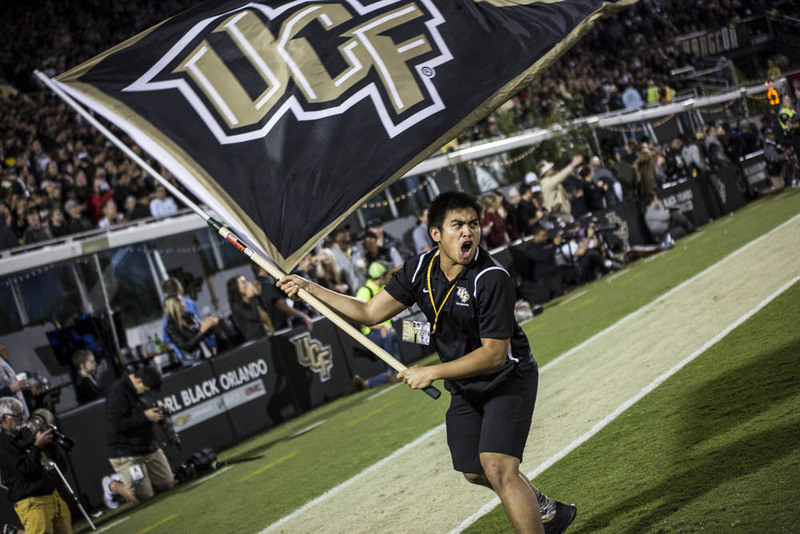 14A student waves a UCF flag to get the crowd excited. 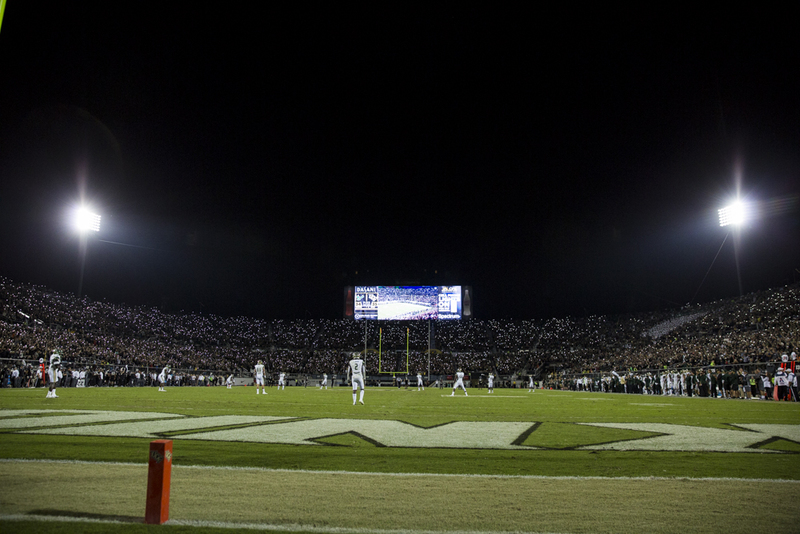 15Knights fans light up the stadium using their cellphones. 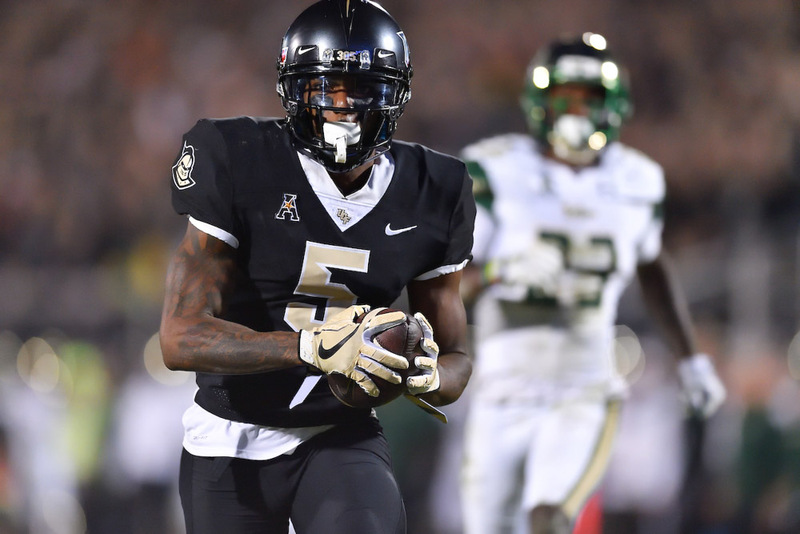 16Snelson runs the ball into the end zone to put UCF back in the lead at 35—34. 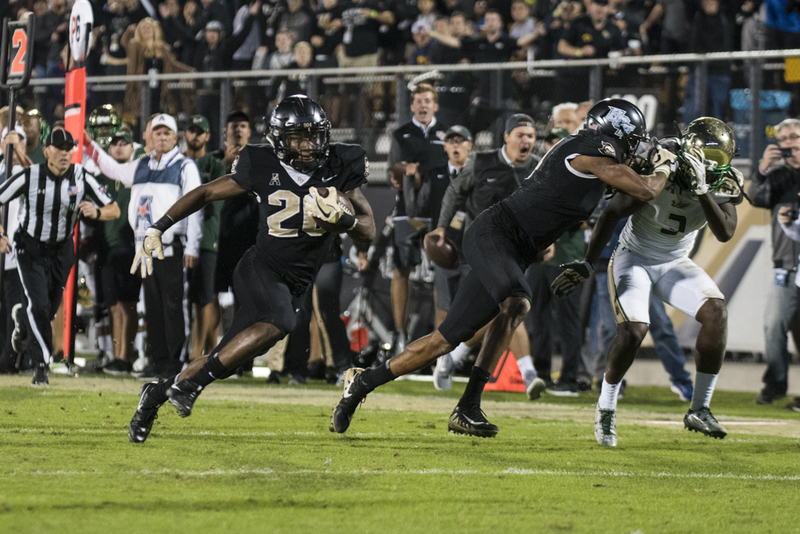 17Redshirt senior wide receiver Tre’Quan Smith blocks a USF player, allowing freshman wide receiver Otis Anderson to score the sixth touchdown for the Knights, bringing the score to 42—34. 18In the final minutes of the game, junior defensive back Mike Hughes returns a 95-yard kick-off to break the 42-42 tie. 19As Hughes enters the end zone, the Knights take the lead, making the score 49—42 with 01:28 left in the game. 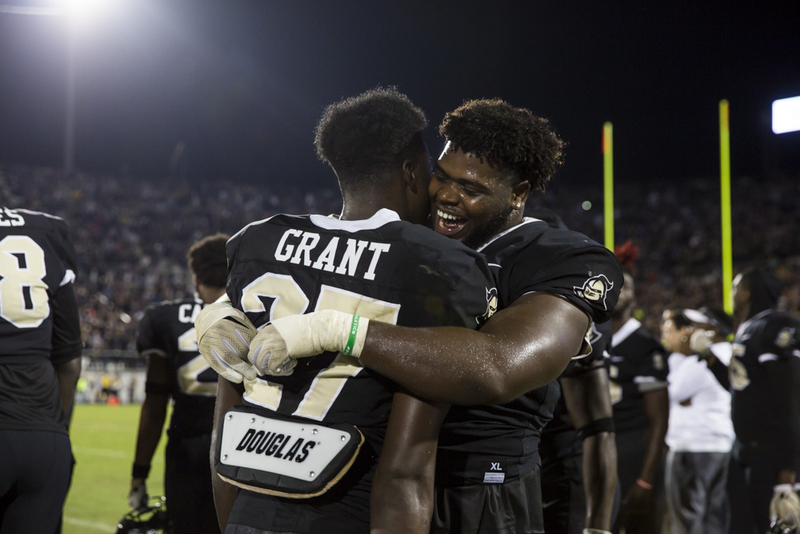 20Senior defensive lineman Jamiyus Pittman embraces freshman defensive back Richie Grant, who punched the ball free from USF tight end Mitchell Wilcox, ending the game and sealing the win for UCF. 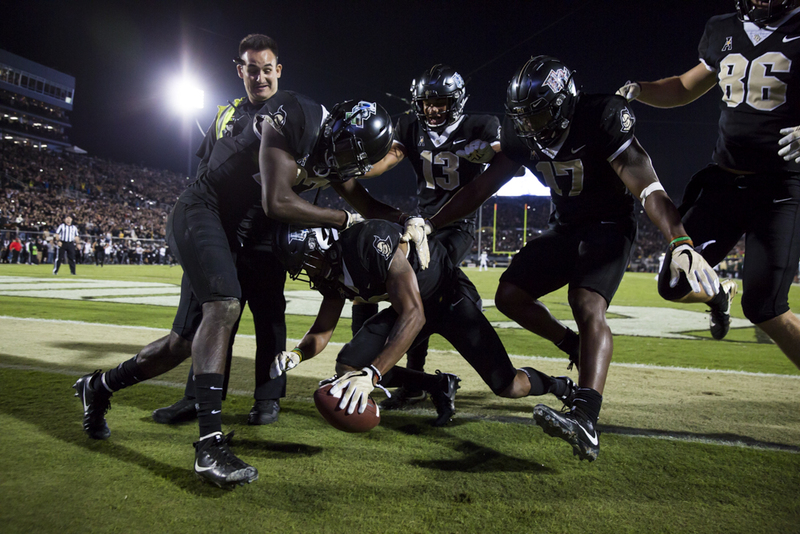 21Freshman offensive lineman Samuel Jackson joins teammates in soaking head coach Scott Frost in ice water after the big win. 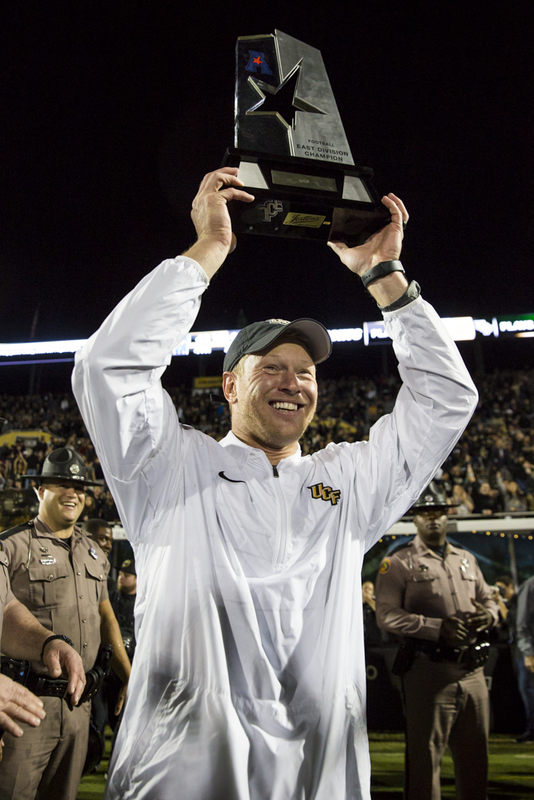 22Coach Frost hoists the trophy for the American Athletics Conference East Division Championship title. 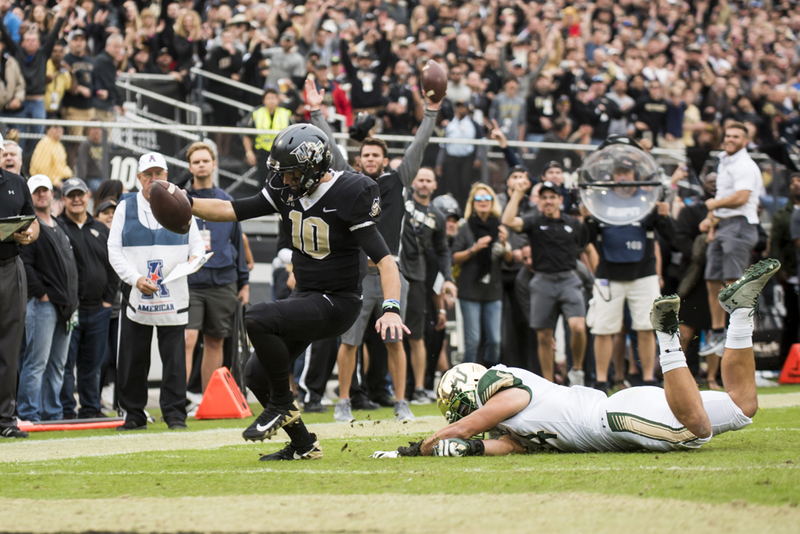 After only two years as coach, Frost led the Knights to UCF’s first undefeated season. 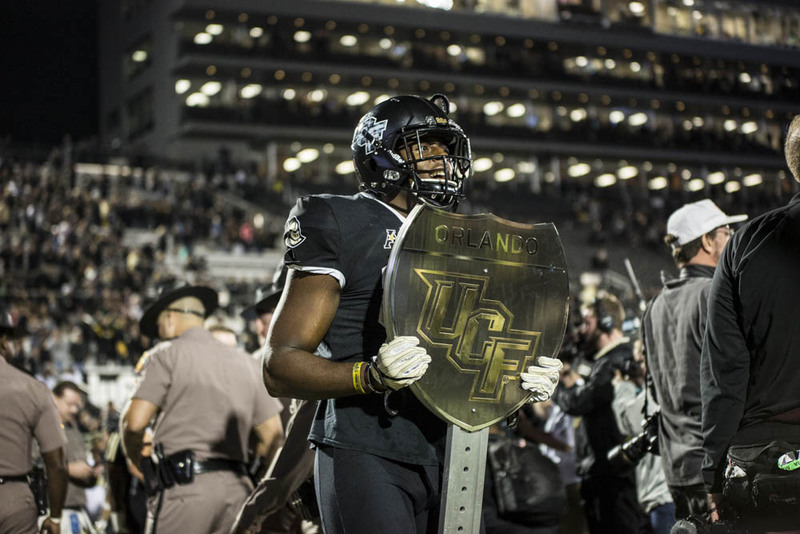 23The Knights clench the War on I-4 title for the second year in a row. 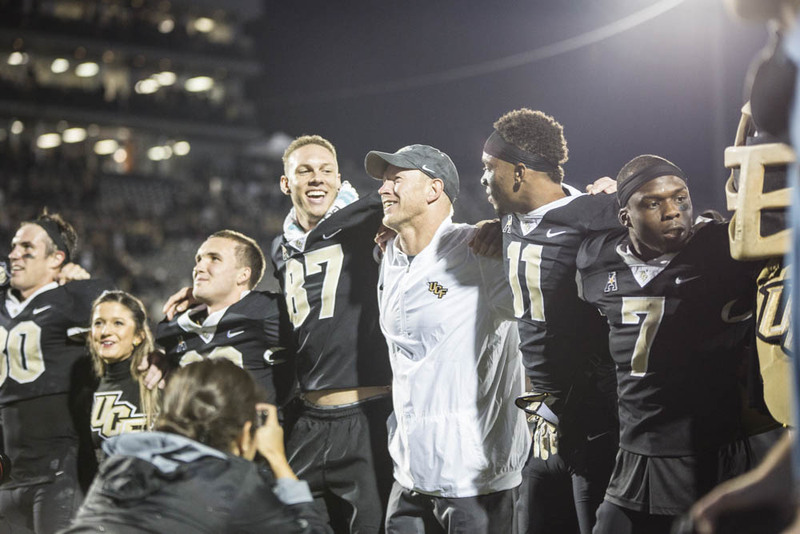 24After their victory, Frost joined football players and cheerleaders in singing the Alma Mater to the student section. 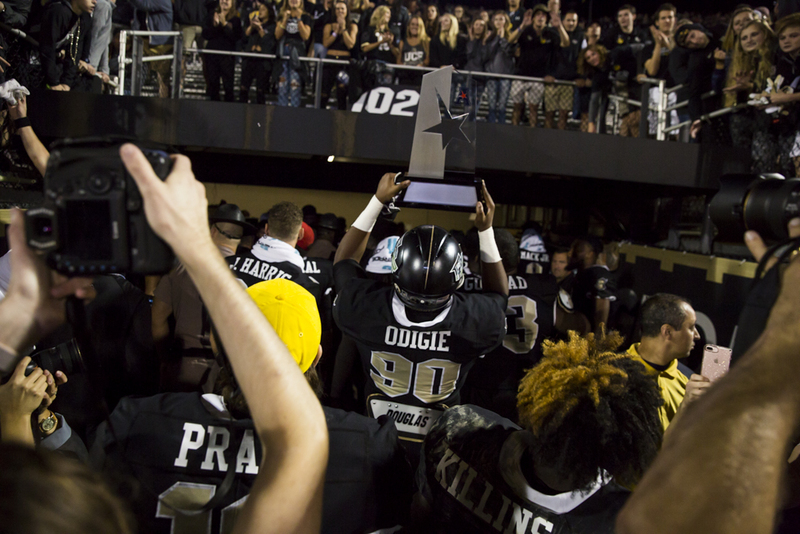 25Senior defensive lineman Josh Odigie hoists the AAC East Division Championship trophy over his head as the Knights head into the locker room.